NOTE: The picture is just to show you what the item is, but will be for the year and model listed in listing. Constructed of 16 gauge steel for a heavy-duty vault like security. Powdercoated Black finish to match or compliment your Jeeps interior. Vaulted glove box replaces the factory glovebox with no modifications to the vehicle. 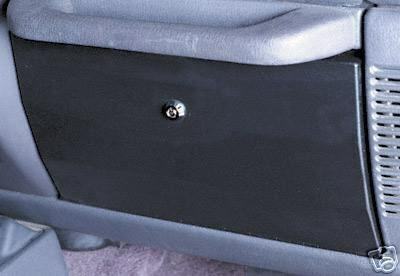 Locking compartment will secure your valuables and provide you with peace of mind while your Jeep is parked or while out on the trail. All necessary hardware and installation instructions are included with the kit. legal note: We are not responsible for errors in this ad or anything stated in this ad that is incorrect.